Qianlong Emperor (1711-1799) - While his grandfather, Kangxi Emperor, was the longest reigning emperor in China's history, Qianlong very easily could have been, but he voluntarily abdicated after just over sixty years of rule in deference to his revered predecessor. He was born Hongli in 1711 and lived the first decade of his life during Kangxi's reign. 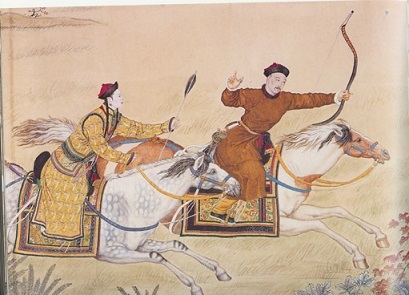 His grandfather was said to adore him; in fact, Hongli's father may have been chosen as Kangxi's heir (he was fourth in line by age) just so Hongli could inherit the throne. He rose to emperor in 1735, and stepped down in 1796, only a few months short of his grandfather's reign; then went on to live another three years. However, even though he was no longer officially emperor, he remained the de facto ruler until his death. He was also a transitional emperor for the Qing dynasty. The first half of his reign was considered successful, but the Qing entered into decline in the latter half of his rule. A large part of this can be attributed to his military ambitions. Although he successfully expanded China's empire, his almost constant warfare drained Qing's treasury and man power. To the west, he conquered the Dzungar Khanate. This led to the most notorious atrocity of his reign, the Dzungar Genocide. He ordered the systematic extermination of the Dzungar people (descendants of the Mongols). In the south, Qianlong met much stiffer resistance. He tried to conquer Burma during the Sino-Burmese War and invaded the country on four occasions between 1765 and 1769. But he failed each time. Toward the end of his reign, he also invaded Vietnam, and although he captured the capital initially, the Qing army was ultimately defeated and had to retreat. Other countries, much further away, also had dealings with the Qing at this time, but on an economic basis, not military. Western European nations wanted to open up trade, and both Great Britain and the Netherlands established embassies in China in the 1790s. The cultural differences between Great Britain and China soon became evident, however, and deteriorating relations eventually led to war in the 19th century.